This entry was posted in Blogging, Family, Ministry Update, Promoting Christ by Bryn. Bookmark the permalink. I am so glad to read that you are beginning as well as you ended…it makes it easier to “send” you, and Allie and Anya off. I’m so glad the suprise worked…Heather and your Clerk of Session worked really hard on that – if only we weren’t on PEI that night!! Welcome from a former elder (son of a Presbyterian Minister in the U.S.) and his wife, who was one of the Kirk;s first woman elders. 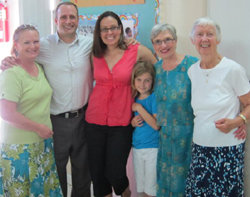 We have been most critical of the Kirk becoming affiliated with the EPC, but are wholeheartedly in favor of the Kirk, as soon as possible, helping to launch, and then becoming a part of “The Presbyterian Church of the Bahamas”. I did attend the service Sunday, and was impressed with what I saw of you, but your role in the service was certainly limited. I couldn’t stay for the lunch and never did get to actually meet you or shake your hand (my wife was in the states attending a grandsons, prep school graduation). We will now both look forward to meeting you and your wife and believe, under your leadership and guidance, the Kirk can be off to new heights. Just a note to say we’re around the corner from you at the British Colonial Hilton this week, and have been thinking and praying for you. You’ll be missed in Toronto, but it’s great to see your new neighborhood. We’re sure you’ll be used by God here. Darryl–you’re in Nassau??!! Until when? You are walking distance to the Kirk (Market & Shirley St.). If you’re around on Sunday, you should come for the 10:30 service. It would be great to see you! Sadly, we leave Saturday. We almost came to St. Andrews last Sunday. If we had known how close it was to the hotel, I think we would have come for sure. We walked by yesterday and took a look at the church.